Queen Anne Elementary was designed around our Five Pillars with a digital learning emphasis. As a Creative Approach School (CAS), we joined Project Based Learning (PBL) and Social Emotional Learning (SEL) with our Five Pillars. 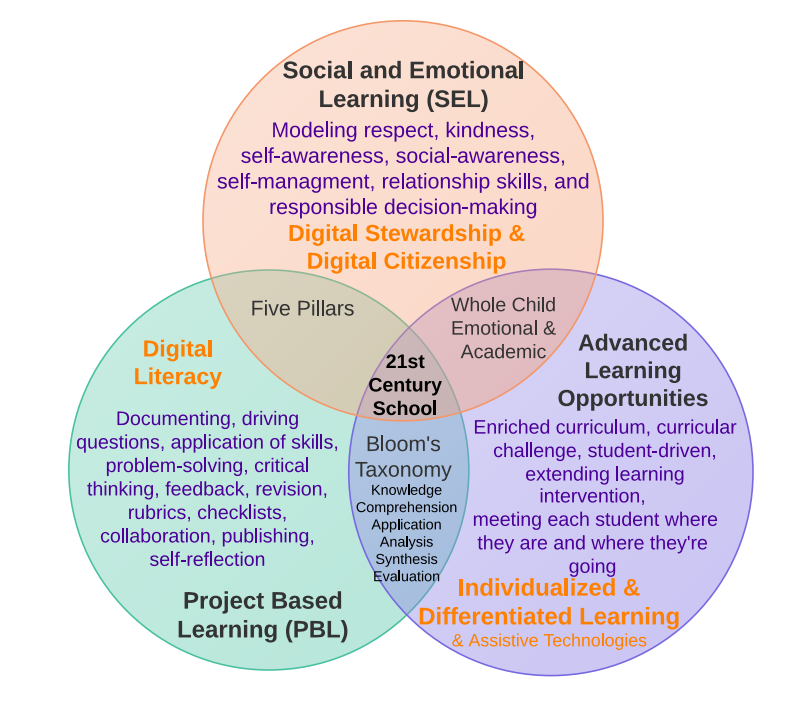 These three components are the foundation of our curriculum and guide our staff and students’ pursuit to develop a community of 21st Century learners. Digital tools are integrated into the classroom, across curriculum, to deepen and enhance learning through our One to World device program. One to World empowers students to research, create, connect, and collaborate. Students actively engage and work together to capture their creativity and learning through technology tools such as cameras, video, audio, and multi-media productions. Students connect and learn with classrooms around the world through programs like Mystery Skype. Technology also changes the ways teachers teach--One to World offers effective ways for teachers to reach different types of learners to help make learning more meaningful and fun. Our school environment encourages the positive social and emotional development of all students. Several differentiation strategies are used that include acceleration within the regular classroom, cluster grouping, flexible groupings for instruction, and technology integration to support project based learning. Check out this Welcome to QAE flyer with all the details about what's going on at our school! You can also learn more about Social Emotional Learning at QAE. Collaborative Literacy is a rigorous, yearlong curriculum for students in grades K–6 that addresses the core reading, writing, and speaking and listening skills that students need while fostering their growth as caring, collaborative, and principled people. With Collaborative Literacy, students aren’t just learning to read and write; they are learning to be readers and writers who think critically and learn from and care for one another. They develop a genuine interest in and love of reading, and they are motivated to write purposefully with a real audience in mind. They are part of a classroom community where students feel empowered, are supported in taking risks, and are responsible to themselves and the group. Learn more on the Center for the Collaborative Classroom site. Our Reading and Writing Workshop curriculum is guided by the Teachers College Reading & Writing Project (Columbia University). Queen Anne Elementary strives to provide a challenging and inspiring mathematics education for all students. By offering rich mathematical opportunities, which encourage insight and exploration, we seek to increase student self-confidence and help students use numbers to make sense of the world around them. Our staff honors individual and unique learning styles, utilizing research based methods, as they instruct students to build a relationship with math. We believe success in mathematics is a result of a connection between critical thinking, effective communication, and the application of prior knowledge. It is our goal that all students feel successful in math and are able to transfer their acquired knowledge to a variety of contexts in future endeavors. Ready Mathematics helps teachers create a rich classroom environment in which students at all levels become active, real-world problem solvers. Through teacher-led instruction, students develop mathematical reasoning, engage in discourse, and build strong mathematical habits. The program’s instructional framework supports educators as they strengthen their teaching practices and facilitates meaningful discourse that encourages all learners. Encourages students to develop a deeper understanding of mathematics concepts through the embedded Standards for Mathematical Practices. Incorporates a classroom mathematics routine that promotes conversations and increases accessibility of the mathematics for all students. Prepares students for the challenges of the state assessment with tasks and activities that have a balance of conceptual understanding, procedural skills, fluency, and application. Seattle Public Schools adopted Math in Focus (Singapore Math) as the math curriculum for students in grades K-5. Math in Focus adapts instruction to the needs of individual learners through scaffolding, the systematic sequencing of prompted content and support to optimize learning. The ultimate goal of scaffolding is to gradually remove the supports as the learner masters the task. This year we've added a MakerSpace to our art offerings! A MakerSpace “is a collaborative work space inside a school, library... for making, learning, exploring and sharing that uses high tech to no tech tools. These spaces are open to kids, adults, and entrepreneurs and have a variety of maker equipment including 3D printers...”, scissors, glue, cardboard and whatever else students can dream up. Founder of the maker movement, Dale Dougherty, describes a MakerSpace as a "...creative process of taking an idea, developing it, using tools and techniques to make it real." Students are scheduled for weekly visits to the library to browse and check out books. Visit qaelibrary.org for more information. Seattle Public Schools adopted the Five for Life curriculum for Physical Education. This curriculum stresses the 5 components of Fitness: Cardiorespiratory Endurance, Flexibility, Muscular Endurance, Muscular Strength and Body Composition. All the students learn about these concepts through fun PE games and activities. Our Resource Specialists and Resource Instructional Assistants work with individual students in the classroom, as well as small groups in the Learning Lab. Resource Specialists collaborate with classroom teachers, parents, and support staff to develop the best plan for each child. The Learning Lab provides appropriate and meaningful opportunities for students to learn at their own level to ensure academic, emotional, and behavioral growth. Our math and reading specialists provide supplemental instruction in math and reading for students needing more support in these areas. Students work in small groups on specific, targeted skills in addition to the interventions provided by their classroom teachers. Our School Psychologist and Counselor work together to provides counseling, instruction and, mentoring to students who are struggling with social, emotional, and behavioral problems. Positive Discipline in the Classroom (developed by Jane Nelsen and Lynn Lott) is a research-based classroom management program that empowers teachers with skills to build their students’ sense of community, prepare them for successful living, and increase academic achievement. Experiential learning methods give you skills to help students practice better cooperation, social skills, self-direction, responsibility, and mutual respect in the classroom. The Zones of Regulation is a curriculum geared toward helping students gain skills in consciously regulating their actions, which in turn leads to increased control and problem solving abilities. Using a cognitive behavior approach, the curriculum’s learning activities are designed to help students recognize when they are in different states called “zones,” with each of four zones represented by a different color. In the activities, students also learn how to use strategies or tools to stay in a zone or move from one to another. Students explore calming techniques, cognitive strategies, and sensory supports so they will have a toolbox of methods to use to move between zones. To deepen students’ understanding of how to self-regulate, the lessons set out to teach students these skills: how to read others’ facial expressions and recognize a broader range of emotions, perspective about how others see and react to their behavior, insight into events that trigger their less regulated states, and when and how to use tools and problem solving skills.